This page is an archive of clay art that has been sold. If you find a piece that you are interested in, let me know and I may be able to make a piece for you in that style. Each piece is signed and is an original. This bowl is made of white, yellow, blue, green and brown clay. The mat finish gives the clay a pastel appearance. This simple bowl is a definitely a "one-of-a-kind" bowl. The spatial arrangement of colors and shapes lends itself to a wide variety of interpretations. This bowl is made of individual pieces of red and white clay. 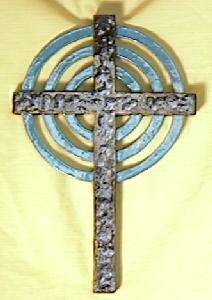 This cross is hand formed from white clay, including the arcs. The arcs of the cross project dramatic shadows. Click for detail. 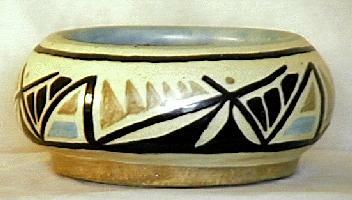 This bowl celebrates the Native American tradition of pottery. 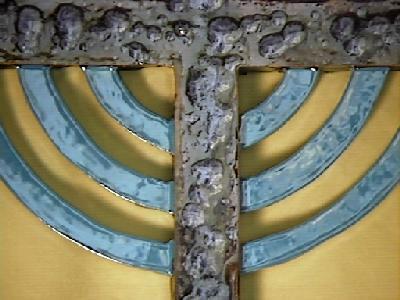 The decoration is both primitive and modern in design. Clay: Stoneware | Glaze: food safe | Height: 3.5" | Diameter: 7"
This bowl is comprised of two high contrasting clays, white and red. The pattern is orderly but random.